The Latvian Evangelical Lutheran Church in Great Britain was established when Latvian refugees arrived in Britain after the Second World War. Nowadays we have six congregations with three pastors and a non-stipendiary Dean. The work of each congregation covers a wide area, with services held in several locations, mainly in England, but also, in the case of one of our congregations, in Wales. Our members are mainly Latvians and their families. Because of this, our services are predominantly in Latvian, but the pastors, church workers and members of the congregations, many of them British born, also speak English and welcome non-Latvian speaking visitors and family members. Increasingly, since Latvia became a member of the European Union, our congregations are being joined by recent arrivals from Latvia. After the Second World War, when Latvia was under Soviet occupation, the Evangelical Lutheran Church of Latvia, that had been founded in 1922, was split into that part of it that was operating in Latvia under the constraints imposed by the Soviet regime and that part of it that was abroad in exile, each with its own archbishop. This split in our church between the Evangelical Lutheran Church of Latvia and the Latvian Evangelical Lutheran Church Abroad remains to the present day. Nevertheless, since the fall of the Soviet Union, despite some differences in outlook, our two churches have been able to recognise each other openly and work together more closely. Both regard themselves as being in succession to the Evangelical Lutheran Church of Latvia that existed before the Second World War. The Latvian Evangelical Lutheran Church in Great Britain is part of the Latvian Evangelical Lutheran Church Abroad, which has congregations all over the world and is a member of the Lutheran World Federation, the World Council of Churches and the Conference of European Churches. The largest congregations are in the USA and Canada, but there are also congregations in Australia, South America and in other European countries. Our archbishop, Lauma Zušēvica, lives in the Unites States. Especially in its early years, the relations of our Latvian Church in Great Britain with the Church of England were based upon the 1938 Agreement of Intercommunion between the Church of England and the Evangelical Lutheran Churches of Estonia and Latvia. 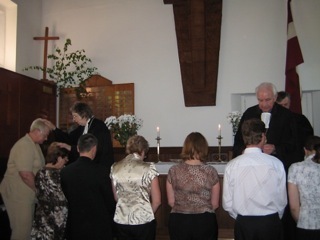 More recently, the Latvian Evangelical Lutheran Church Abroad was closely involved in the process that led to the Porvoo Declaration, where the representative of both branches of the Latvian Evangelical Lutheran Church, in Latvia and abroad, was the then Dean of the Latvian Evangelical Lutheran Church in Great Britain. The Latvian Evangelical Lutheran Church Abroad signed the Porvoo Declaration on 19th September, 2014, and is now a full member of the Porvoo Communion, which brings together in full communion Anglican and Lutheran churches in Europe.